Joey stuffing his head into a turkey, Phoebe giving birth to her brother’s triplets, and Ross losing his sh*t over a sandwich are just some of the weird and wonderful moments Friends has given us over the years. But now the funniest, cringiest, and most questionable references have all been collated together to create the game we didn’t know we needed until now; a Friends-themed Cards Against Humanity-style game. For any innocent souls who’ve never played Cards Against Humanity, players are asked to present the card which has the best, albeit probably most atrocious, answer to a question or statement out of their hand, and the most fitting answer is chosen as the winner. I’d give you some examples of the resulting sentences, but honestly I don’t think I could come up with anything appropriate and inoffensive enough to write. 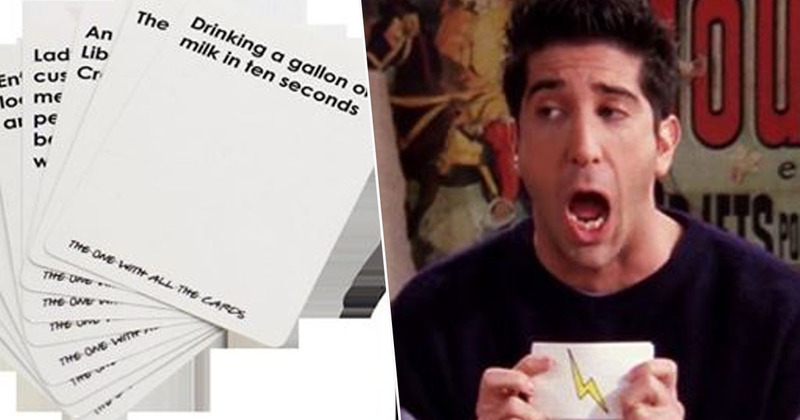 This Friends-themed pack of cards isn’t actually affiliated with Cards Against Humanity or the American show, but the game follows the same rules and would make the perfect gift for any fans of the sitcom. The fan-made pack allows players to fill in the blanks with the very best Friends-related answers, and can be purchased as a physical pack of cards, or a printable download if you’re up for saving some money and have a little cutting-out session. 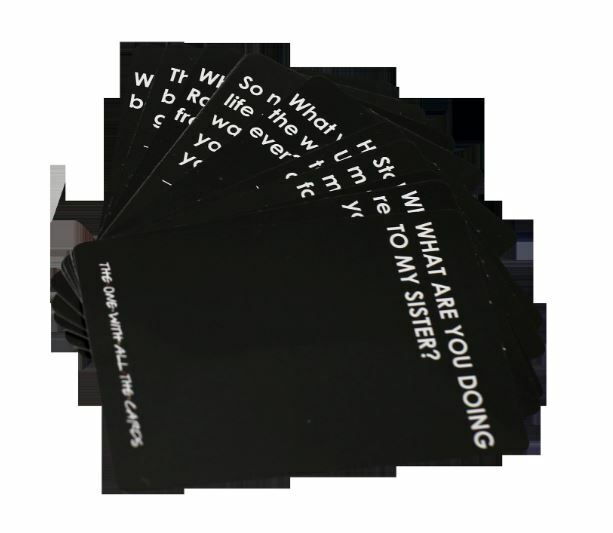 This is printed version that includes 99 gray cards and 180 white cards for “The One With All The Cards,” a Friends themed fill-in-the-blank game. While there are sufficient cards to be played as a stand alone game, they are sized identically and can integrate hilariously into standard Cards Against Humanity decks. One question up for debate in the game is ‘What are you doing to my sister?’, taken from the episode where Ross finds out Chandler and Monica are getting it on, while one of the statements – or in this case songs – left to fill is ‘so no one told you life was gonna be this way, your job’s a joke, you’re broke, your love life’s …’. To be fair, the lyric already ends with the fairly brutal ‘D.O.A’, which stands for dead on arrival. But it would be interesting to see what else people come up with! The responses in the pack include things like ‘drinking a gallon of milk in 10 seconds’, circa Joey’s résumé, and ‘Ichiban; lipstick for men’. I’m sure there’ll be a number of hilarious combinations to work with!